In Vista, everytime you run a program- you are asked to confirm if you want a certain program to make changes on your computer. This security feature is called the User Account Control or UAC. UAC helps prevent potential harmful programs from making changes to your computer. Some users dislikes this feature as UAC keeps on popping-up even running a program that is used most of the time and seems to become annoying on some cases. UAC come along also with Windows 7, with a default setting wherein a user is notified only when a certain program try to make changes to the computer. If you dislike Microsoft’s default settings for UAC in Windows 7, it’s much easier to make the UAC even less intrusive. 1. From the Start Menu, go to the Control Panel. 2. Click on the User Accounts, and Click on Change User Account Control setting. 3. 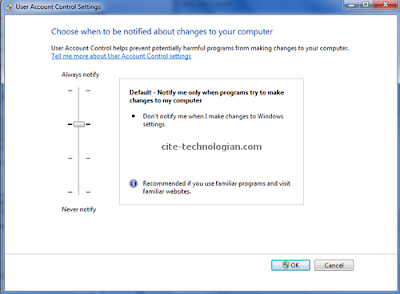 On the User Account Control Setting window, adjust the setting from “Never Notify” to “Always Notify”. You have four options. Just read the details on the right side as shown below. 4. If done, simply click OK then Restart your PC to apply the changes. If you like this post, you can subscribe either by E-mail or by RSS Feeds. Next PostFacebook Profile Unavailable Error – How to Fix It?